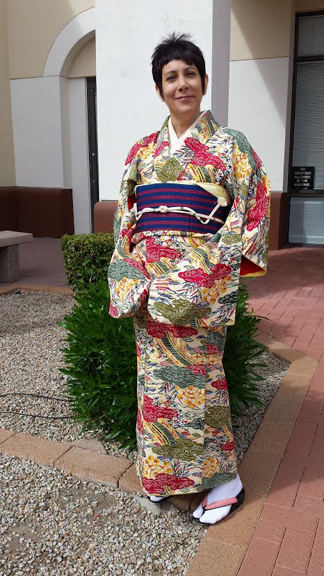 Shakunetsu no Kimono: Arizona Matsuri 2017- Bingata! I survived Matsuri weekend in Phoenix on Feb. 25-26! 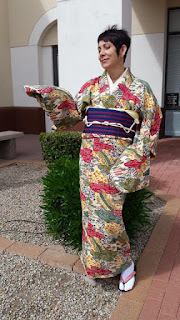 The weather was just about perfect- not super hot like last year, so I was able to wear a kimono rather than a yukata this time. 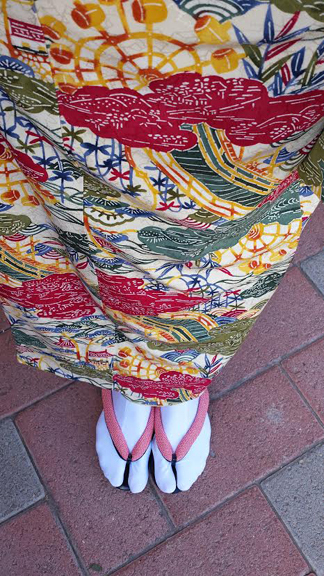 I had a taiko performance on Saturday and Sunday I wore my favorite bingata kimono with a hakata tsuke obi. 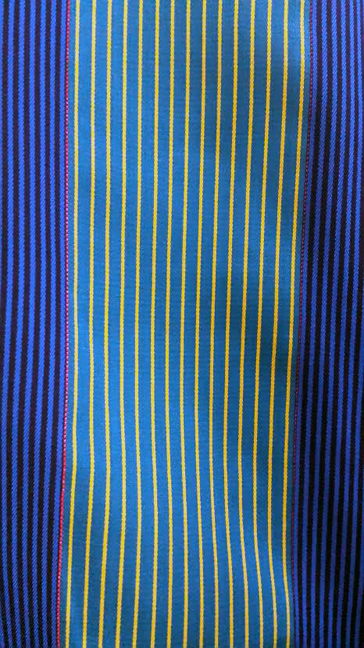 Tsuke obi is a 2-piece pre-tied obi with taiko musubi (knot), a wonderful thing when you are pressed for time early in the morning when everyone has to get to matsuri on time! 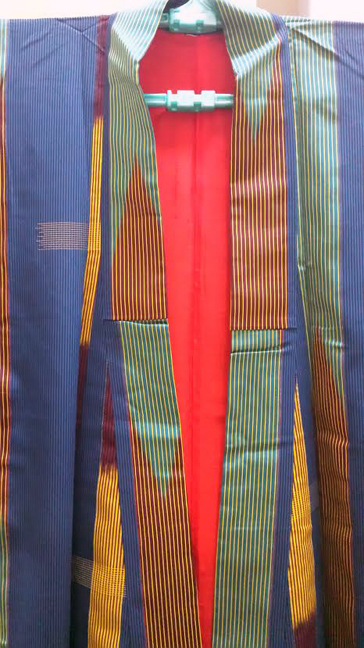 When I first found this obi, I wasn't sure about it since it seems like cheating and I wasn't crazy about the red and blue colors but now it's one of my favorite hakata obi and looks really nice with this kimono. 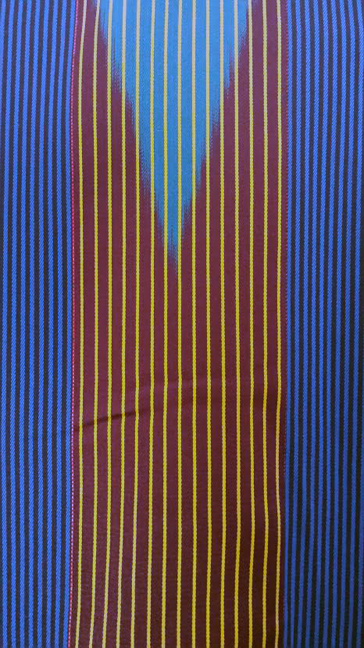 The other obi I usually wear with this kimono is a semi-formal Nagoya obi, with some metallic threads. I wanted to stay more casual for the festival and this obi is thinner and only one layer. Plus the black and red zori I'm wearing below are more casual than the metallic gold and red zori I would have worn with the more formal Nagoya obi. 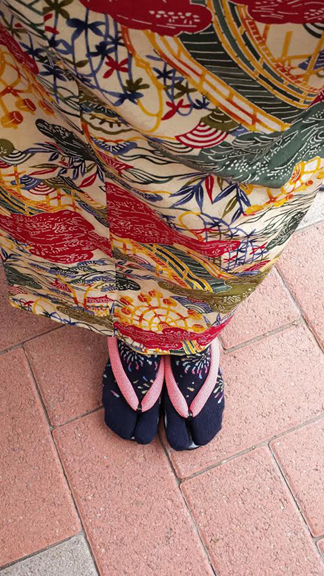 I managed to find some fun items this year- hanabi tabi sox, white stretch tabi (so comfortable! 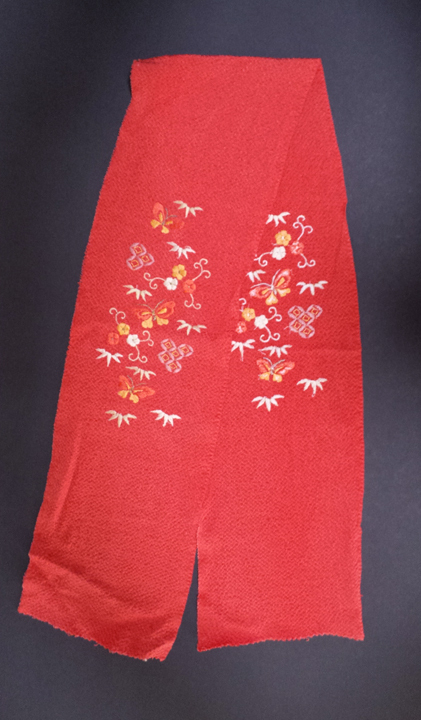 ), and a few fun items from the flea market that they have at Matsuri: an embroidered haneri, a tenugui with birds, and a Japan Airlines apron! The apron seems to have a name on the pocket: "Hanae Mon". It's fitted and wraps around, fastens with Velcro and ties in back. It's super cute and it's perfect for hosting my next cocktail party! Sorry this pic is fuzzy! 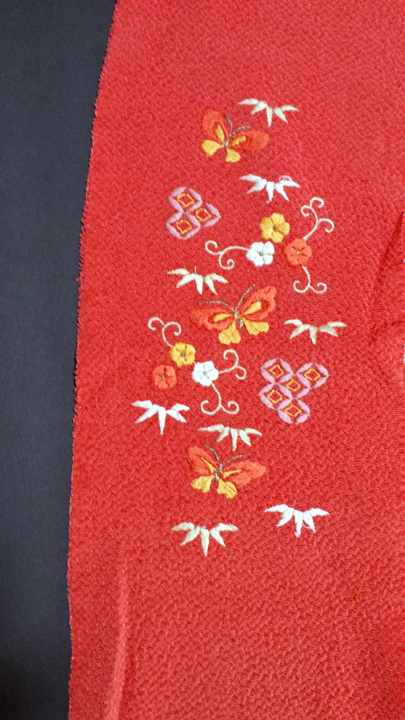 The haneri (Detachable collar for an under kimono) was a great find and really beautiful- chirimen silk in a soft deep pinky-red-orange color that is really difficult to photograph. The embroidery is multi-season, with bamboo, plum, butterflies and little geometric shapes and just a touch of metallic threads. 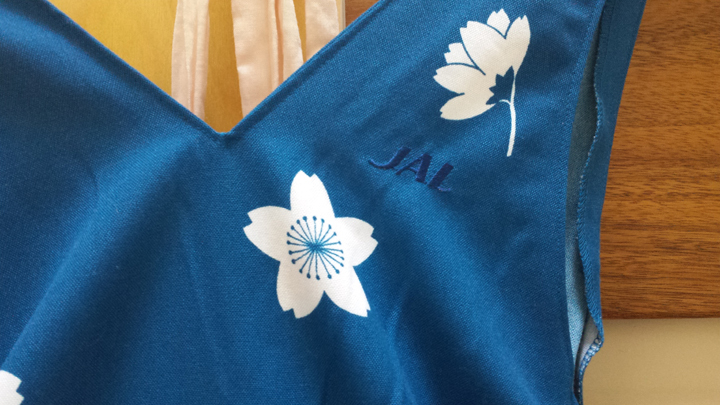 I haven't had a chance to see what kimono it will go with but I may start working on that tomorrow. Tenugui- these look suspiciously like seagulls! 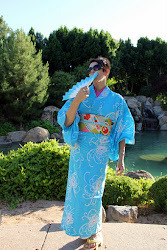 And of course, I found a kimono! I need to take some better photos very soon and figure out what obi goes with this, but for now, a teaser. 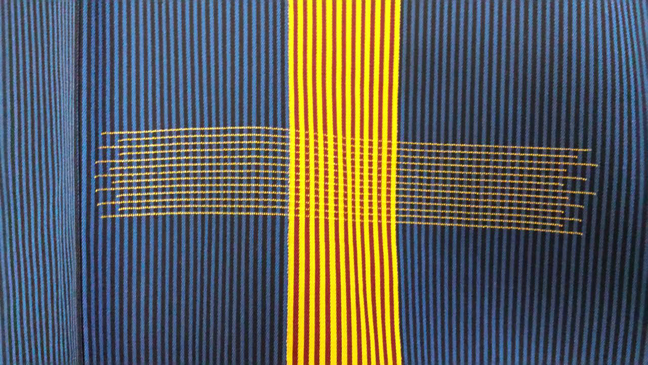 Check out those pinstripes! 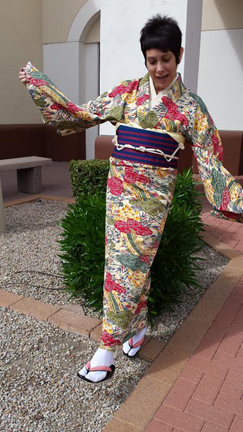 More photos soon, especially of that new kimono- it's is amazingly retro-cool.